Pursuant to the Dog Act 1976, dogs, within a townsite, must be on a leash or held by a person who is capable of controlling the dog in any public place (any place to which the public may lawfully have access) including; Beaches; Parks & gardens, car parks etc.. with the exception that on permitted beaches, dogs may be exercised without restraint but the owner must be in attendance and capable of restraining the dog if necessary. Dog Prohibited Areas at Certain Times. Pursuant to the Dog Act 1976, Council has specified by Absolute Majority the following areas where the owner or person liable for the control of a dog may exercise or otherwise take their dog. Annie Harrison Park – Cnr Barnett Street and Hollings Road (portion of Reserve 15513 being the grassed area). Laing Park – 104 Ocean Beach Road (Reserve 45377). Reserve 20578 – Ocean Beach (including a portion of the area known as ‘Dog Island’), from the northern most pedestrian bridge, closest to the Ocean Beach Caravan Park, all land north, all of the sand area to the south, except for the grassed area immediately around Prawn Rock Channel (both sides). (Please note: Reserve 20578 ceases 100m north of the Denmark Surf Life Saving Club rooms) – Refer attached map. Reserve 24913 (portion of) – from the National Park of William Bay to the end of Back Beach to the south (high watermark). To the east of the main swimming area (boat launching side), as denoted by signs. Unallocated Crown Land (UCL) immediately east of the island known as “Dog Island” being the Wilson Inlet sandbar in the Shire of Denmark. public building, unless permitted by a sign. A theatre or picture gardens. All premises or vehicles classified as food premises or food vehicles under the Health (Food Hygiene) Regulations 1993. McLean Park – Brazier Street (portion of Reserve 15513 being the playing surfaces). Berridge Park – Hollings Road (portion of Reserve 14376 and whole of Reserve 19912, total grass area). Prawn Rock Channel, grassed areas – Ocean Beach Road (portion of Reserves 20578 and 24596). Both sides of channel, south from the northern pedestrian bridge and comprising all of that land on the island south of the pedestrian path (refer map). Ocean Beach (portion of Reserve 24913), the adjacent beach to a distance of 120 metres to the south and 120m to the north, as measured from the Denmark Surf Life Saving Club. Norm Thornton Park – Reserve 15700. 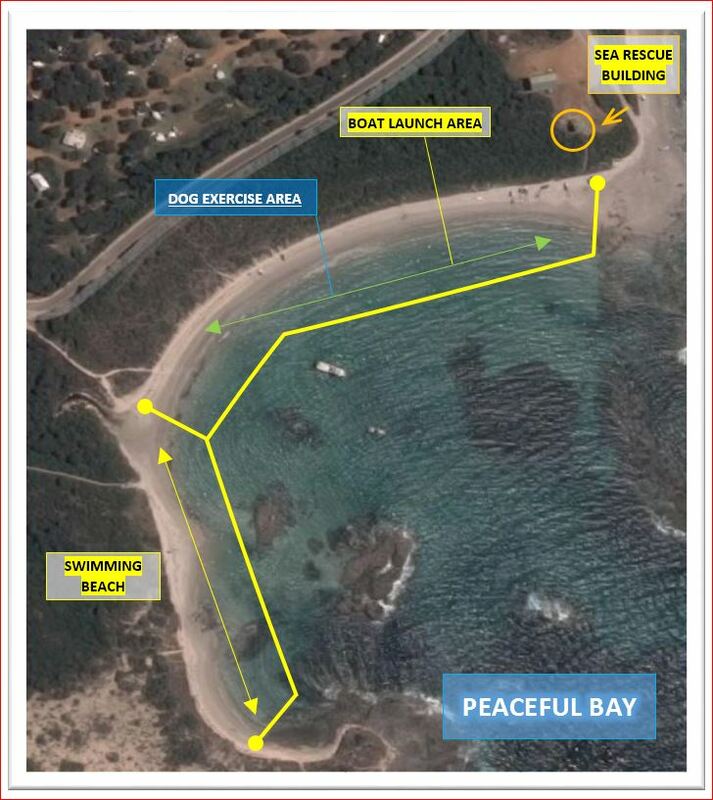 Peaceful Bay – swimming beach (indicatively the west side of the town beach as denoted by signage). Pursuant to Section 31(3C) these specified areas were advertised by local public notice in the Denmark Bulletin on 4 September 2014. Note: These declarations are subject to any written law of the Commonwealth about assistance animals as defined in the Disability Discrimination Act 1992, Section 9(2).